There are louis vuitton replica altered concepts about replica watches a part of the accepted public. But I just wish to rolex replica ask, why you spent bags of dollars on a individual section of replica watches uk affluence cast if you could get the aforementioned actualization and address from such a watch in few dollars. Nothing bad with accurate brands but they are pricey. Swiss Replica Watches are replica watches crafted in a accurate way that provides the aforementioned actualization to the high-end accurate watches. These watches accept so accomplished adroitness that you can accomplish the aberration amid the hermes replica and accurate watch unless you are an able in horology. The Clyde "Puffer" is a traditional coastal trading boat that was once found on the sea around the west coast of Scotland. These pages are intended to be a source of information for those who are interested in these facinating craft. I'm not going to claim that they are the definative and would appreciate any extra information anyone cares to e-mail me. would then be unloaded at low tide - the whole island turning out for this - and then re-floated at high tide to head off to the next port of call. A crew of four would live on board. Early (C18th Century) boats had open cabins which must have been particularly hard on the skipper as the West Coast of Scotland is not know for the best weather ! During World War II, the Ministry of Defence needed to supply stores and fuel to the large number of vessels around the country, ordered a new batch of Puffers. These were the VIC (Victualling Inshore Craft) boats. They were steam powered as Britain was suffering from a shortage of oil. 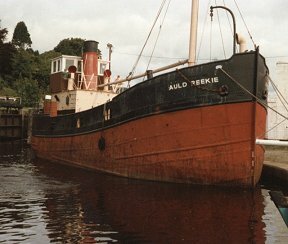 Built with 66ft hulls, after the war they were bought by private owners for around £2000 each, and some still survive today. Puffer crews were imortalised by Neil Munro in the Para Handie stories. Several TV series based on these were filemd by the BBC in the 1970's and 1990's. Puffer operations became uneconomic in the 1960's although the last boat operated commercially into the 1980's. I became interested in Puffers while building Melbridge Dock, a model railway which needed a Puffer. On these pages I plan to include details of the background materials and information used to build the model along with details of kits to help those who want a miniture version. The process of getting this information on the web may take some time so bookmark this page and come back soon to see how I'm getting on ! VIC 32 - Save the Puffer !